"Our observations show there are massive blobs of dust and gas that occasionally block the star's light and are probably spiraling into it," said Kristina Punzi, a doctoral student at the Rochester Institute of Technology (RIT) in New York and lead author of a paper describing the findings. "Although there could be other explanations, we suggest this material may have been produced by the break-up of massive orbiting bodies near the star." RZ Piscium is located about 550 light-years away in the constellation Pisces. During its erratic dimming episodes, which can last as long as two days, the star becomes as much as 10 times fainter. It produces far more energy at infrared wavelengths than emitted by stars like our Sun, which indicates the star is surrounded by a disk of warm dust. In fact, about 8 percent of its total luminosity is in the infrared, a level matched by only a few of the thousands of nearby stars studied over the past 40 years. This implies enormous quantities of dust. But the evidence was far from clear. An alternative view suggests the star is instead somewhat older than our Sun and just beginning its transition into the red giant stage. A dusty disk from the star's youth would have dispersed after a few million years, so astronomers needed another source of dust to account for the star's infrared glow. Because the aging star is growing larger, it would doom any planets in close orbits, and their destruction could provide the necessary dust. So which is it, a young star with a debris disk or a planet-smashing stellar senior? According to the research by Punzi and her colleagues, RZ Piscium is a bit of both. The team investigated the star using the European Space Agency's (ESA) XMM-Newton satellite, the Shane 3-meter telescope at Lick Observatory in California and the 10-meter Keck I telescope at W. M. Keck Observatory in Hawaii. Young stars are often prodigious X-ray sources. Thanks to 11 hours of XMM-Newton observations, Punzi's team shows that RZ Piscium is, too. Its total X-ray output is roughly 1,000 times greater than our Sun's, essentially clinching the case for stellar youth. The team's ground-based observations revealed the star's surface temperature to be about 9,600 degrees Fahrenheit (5,330 degrees Celsius), only slightly cooler than the Sun's. They also show the star is enriched in the tell-tale element lithium, which is slowly destroyed by nuclear reactions inside stars. "The amount of lithium in a star's surface declines as it ages, so it serves as a clock that allows us to estimate the elapsed time since a star's birth," said co-author Joel Kastner, director of RIT's Laboratory for Multiwavelength Astrophysics. "Our lithium measurement for RZ Piscium is typical for a star of its surface temperature that is about 30 to 50 million years old." So while the star is young, it's actually too old to be surrounded by so much gas and dust. 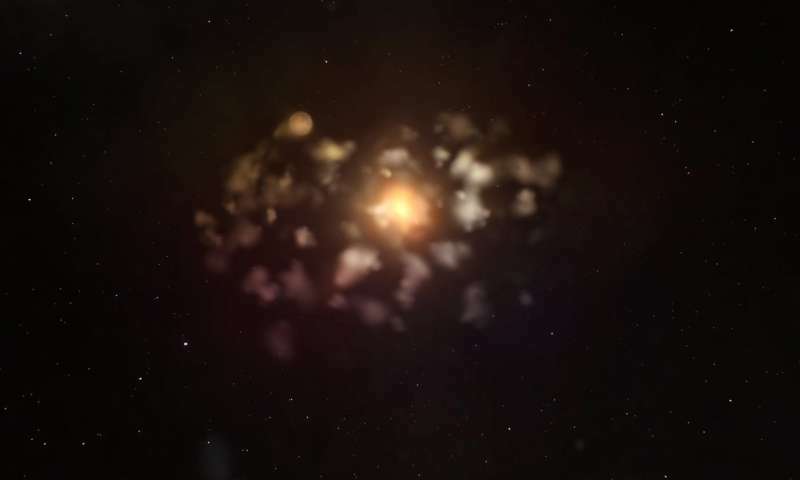 "Most Sun-like stars have lost their planet-forming disks within a few million years of their birth," said team member Ben Zuckerman, an astronomy professor at the University of California, Los Angeles. "The fact that RZ Piscium hosts so much gas and dust after tens of millions of years means it's probably destroying, rather than building, planets." Ground-based observations also probed the star's environment, capturing evidence that the dust is accompanied by substantial amounts of gas. Based on the temperature of the dust, around 450 degrees F (230 degrees C), the researchers think most of the debris is orbiting about 30 million miles (50 million kilometers) from the star. "While we think the bulk of this debris is about as close to the star as the planet Mercury ever gets to our Sun, the measurements also show variable and rapidly moving emission and absorption from hydrogen-rich gas," said co-author Carl Melis, an associate research scientist at the University of California, San Diego. "Our measurements provide evidence that material is both falling inward toward the star and also flowing outward." A paper reporting the findings was published Thurs., Dec. 21, in The Astronomical Journal.